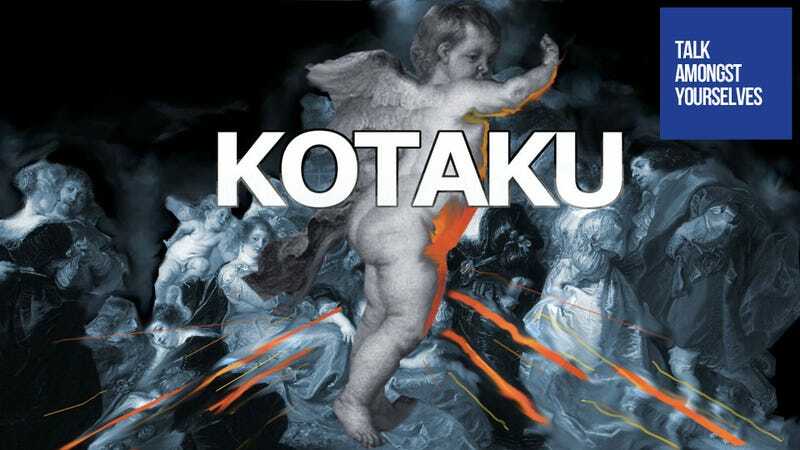 Let's take a break from the fire-scarred fields of battle, put our differences aside, and focus on talking about video games in the official Kotaku forum, Talk Amongst Yourselves. Today's TAYpic from Jimmy_Jazz serves the dual purpose of reminding us which website we are writing or reading while also making us imagine a sweet little cherub spurting fire from its crotch, granting entirely new meaning to the term 'nether regions'. Want to see your own TAYpic atop a future forum post? Monkey around with the base image to create your own TAYpic and share your own riffs on our February image in our #TAYpics thread. Don't forget to keep your image in a 16x9 ratio if you want a slice of Talk Amongst Yourselves glory. Grab the base image here. The best ones will be featured in future installments of Talk Amongst Yourselves.